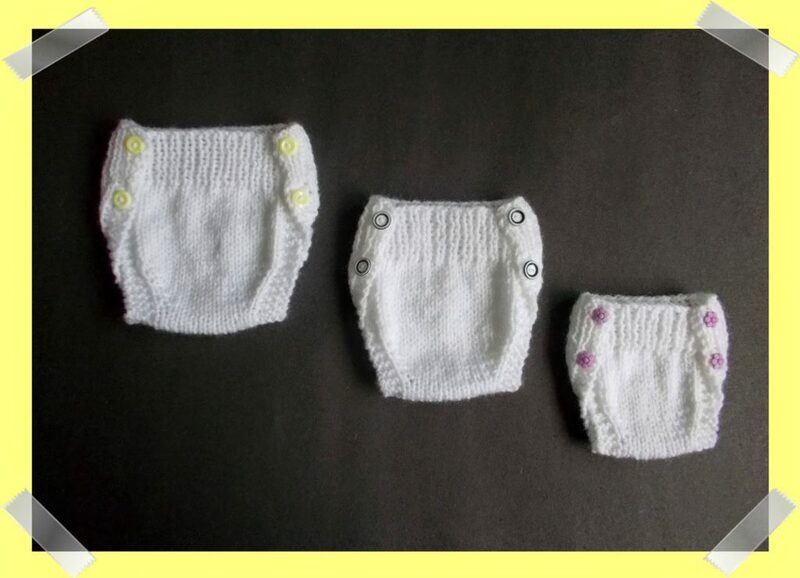 Filing free knit diaper cover pattern ideas. I was introduced to knitted diaper covers also known as wool soakers by another knitter on Facebook. When I was a young girl, our family used cloth diapers. I still remember having to fold so many white muslin sheets into the classic triangular shapes for my baby cousins. If only I knew about diaper covers, I could have knitted cute ones for them. The writer for www.thinking-about-cloth-diapers.com has written a comprehensive article on different types of diaper covers and has a section on wool diaper cover also known as wool soakers. The benefits of a wool diaper cover are absorbency, breathable and anti-bacterial. It is not only good for winter but summer as well because it helps regulate body temperature. The list below contain diapers knitted in various different ways. Marianna provides knitting instructions for a practical and pretty diaper cover. It uses 4 buttons to secure the diaper cover. There are 5 sizes from pre-mature to babies from 0 to 3 month old. It is not a professional pattern, just a generous lady sharing her patterns. Knitted flat in one piece from the back-ribbed band to the front-ribbed band. 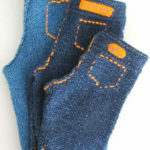 The 4 buttons are sewn onto the front band to correspond with the buttonholes at the back. No seaming required at all. The pattern is free on Marianna’s website. There is no printable version but you should be able to copy and paste into a word document. She has more patterns for babies on her website. Check them out. This is a pull-up diaper cover with eyelets for an i-cord or a drawstring. Pattern includes sizes from newborn to toddler. I went through the instructions and thought the construction is Interesting. Knitted in the round from the ribbed band down towards the bottom. 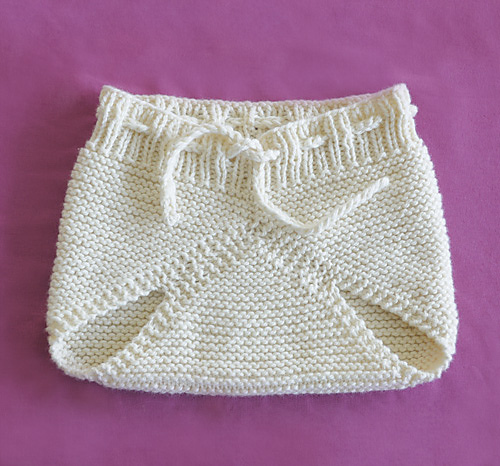 Knit to the top of the leg opening before placing the live stitches on the front of the diaper onto a stitch holder and continue to knitting flat according to instructions. Join the live stitches on the stitch holder and those on the knitting needles using the Kitchener stitch. The pattern is available free on the Punk Rock Knitters website. Isn’t this adaptation soaker just too cute to use? It reminds me of a retro bathing suit. 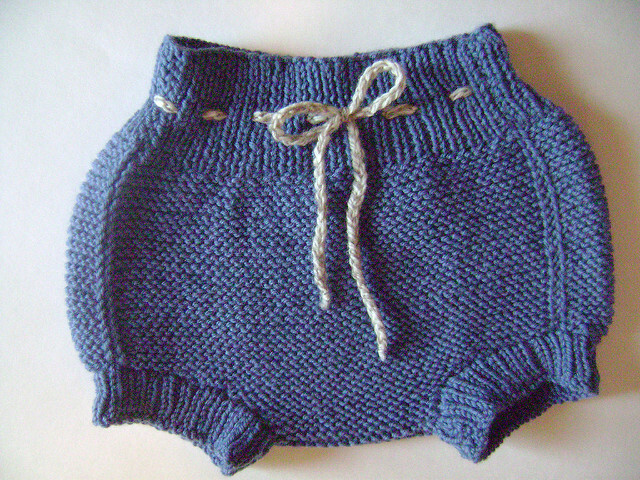 Knitted flat in garter stitch from waistband to waistband in a single piece. It is then folded and seamed. It has a ribbed waistband and leg cuffs. The length of the leg cuffs is adjustable. I think a longer leg cuff might be nicer. This soaker looks similar to the Punk Rock Knitters’ wool soaker but the construction is totally different. 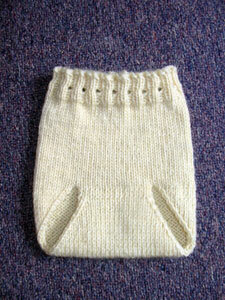 Knitted flat into a rectangle from the waistband to the tip, it is then folded and seamed. If you enjoy this list, you might also like my knitted baby booties list.